Inspired by Oscar Wilde's classic story of hedonism and corruption, The Confessions of Dorian Gray imagines a world where Dorian Gray was real, and his friendship with Oscar Wilde once spawned the notorious novel. Starring Alexander Vlahos as Dorian Gray, this fourth series of supernatural horror stories comprises eight original half-hour episodes.1. The Enigma of Dorian Gray (by Roy Gill). 2. Freya (by Sam Stone). 3. Human Remains (by James Goss). 4. His Dying Breath (by George Mann). 5. Banshee (by Xanna Eve Chown). 6. The Abysmal Sea (by David Llewellyn). 7. Inner Darkness(by Mark B. Oliver). 8. The Living Image (by Matt Fitton). NOTE: THE CONFESSIONS OF DORIAN GRAY CONTAINS ADULT MATERIAL AND IS NOT SUITABLE FOR YOUNGER LISTENERS. Star Alexander Vlahos will be familiar to some from BBC1's Merlin, but more recently he has been acting on Broadway in Kenneth Branagh's acclaimed version of MacBeth. 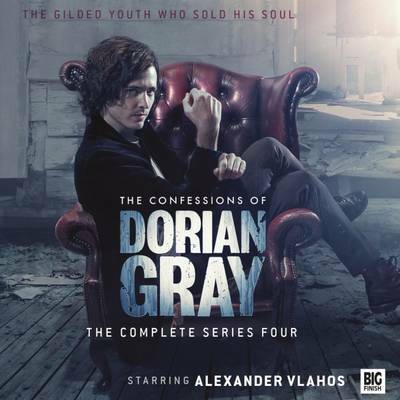 Dorian Gray was first brought to life in 1891's The Picture of Dorian Gray, an initial story retold in audio by Big Finish before they started a dedicated range.C AST: Alexander Vlahos (Dorian Gray), Ayesha Antoine (Flo), Yasmin Bannerman (Alyssa), David Benson(Naval Officer), Jacob Fortune-Lloyd (Billy Fielding), Ross Foley (Medic), Raj Ghatak (Dr. Madras), James Goss (Receptionist), Anthony Howell (Adam Notting), Jacqueline King (Mary O'Tubridy), Bruno Langley (Robert Mardling), Deirdre Mullins (Scarlet Moore), George Naylor (Newsreader), Aaron Neil (Askell Brimson), Katherine Pearce (Freyja), Tim Preston (Waiter), Sakuntala Ramanee (Ruth Miller), Laura Riseborough (Eva Granger), John Sessions (Verger), Connor Vickery (City Chap), Anthony Boyle, Clara Gibbs, Luke MacGregor, Seren Vickers, Betty Walsh (Hospital Patients).